I met Lisa Greer in the early fall of 2010 when I was surfing the internet and landed on her Gothicked blogspot. One of the first things I liked about Lisa’s reviews was that, while she clearly had a love for the vintage Gothic Romance novels that were all the rage in the 1960s and 70s, she didn’t take them or her reviews too seriously. I’ve read numerous blogs and message board posts where readers of these books raved without restraint. Not so with Lisa. When a book disappointed, she wasn’t afraid to say so. She also wasn’t afraid to venture into other forms of Gothic fiction, namely Southern Gothic and Gothic Horror. When we realized that we were both writers finishing the first drafts of our first novels, and that we were working on opposite ends of the Gothic spectrum, the friendship was sealed. I have a clear recollection of seeing my first Gothic Romance paperback novel. I was eight or nine years old which would be about 1968, and a guest in a large, classic Victorian house. 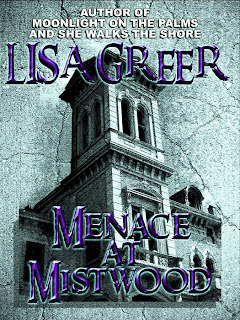 On the book shelf in my room I found a paperback with a picture of a dark mansion with an orange light in a solitary window like some ogre’s watching eye, with a frightened woman fleeing from the house, most likely peering back over her shoulder in fear. I just knew the house harbored terrible secrets and something bad would happen to this poor young woman if she could not escape. Lisa, how did you first discover Gothic Romance and was it in a way that you knew you had stumbled on something truly special in your life? Barrymore, this is really great. We've talked so much about Gothic Romance and the Gothic genre over the last year. It's a pleasure to do it now. I feel a special kinship with you because of our love of the genre, one that is overlooked in my opinion. I guess my first inklings of gothic romance happened with Nancy Drew books. Many of them have Gothic overtones, for sure, and the covers qualify as gothic romance in some cases. I remember reading my first Barbara Michaels gothic romance in early adolescence. I loved how smart these novels were. Around that time, I also came across Wuthering Heights for the first time. That novel still fascinates me with its mixture of the macabre, desire, and obsession. I'll never forget learning the word solipsism with regard to the novel as well. I was hooked on the Gothic genre from then on, and my love expanded beyond Gothic Romance as I got older. Gothic romance, though, is my first love. In 1970 I saw a made for TV movie starring Barbara Stanwyck called The House That Would Not Die, probably my first exposure to a ghost story for grownups. I caught the "based on the novel, Ammie, Come Home by Barbara Michaels" line and the next day made a beeline for the library down the street. 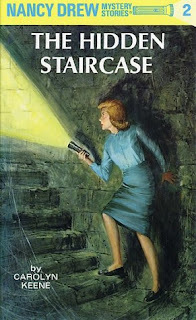 I agree that it's not a large leap from Nancy Drew mysteries to the types of mysteries that we discovered between the covers of these thin paperbacks with their deliciously spooky covers. Ammie, Come Home is now considered a classic ghost story, and no small wonder that it has never gone out of print since first published in 1968. Do you remember which Barbara Michaels title was the first that you read? What elements of her writing kept you coming back for more, and more importantly, have stayed with you over the years and ultimately influenced your own writing? I think Wait for What Will Come was one of the first that I read, and I loved the merman legend and the hero/dancer in it, as well as the spooky ending. The elements of her writing that kept me coming back for more were and still are her sharp wit and willingness to take on religious and social. To me, she does so much more than write a great ghost story. She writes about the real world and how the injustices that are perpetuated lead to disturbances we don't always understand. In my own writing, I try to do something similar. I want to write about things that matter, at least to some extent, even as my books work as entertainment. I tend toward controversial themes, at least for some subsets of my readership. Just like Michaels tackled racism in Patriot's Dream, I tried to do that in an open way in Magnolian. I guess it worked. I've had folks tell me they wanted so and so to read it but were worried about her reaction to the mixed race relationship. I think that by making my characters sympathetic, it opens minds. I've had people who I thought would really dislike the novel say they enjoyed it, so I hope it does, anyway. How about you, Barrymore? Which authors in the Gothic genre most influence your work, and why? How does that influence manifest in your novels? I’d have to say the early novels of Victoria Holt, especially in my second book, The Haunting at Blackwood Hall, although reading them as an adult I’ve come to think that they are more romantic mysteries than Gothic Romances. Holt doesn’t seem too concerned with creating atmosphere in her works, and atmosphere is a huge deal for me. I think the Gothic template in general has stuck with me for the past forty years. 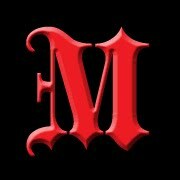 My first two novels begin with this template: due to circumstances beyond her control, an innocent woman is forced to enter a sinister house which triggers a descent into her subconscious where she encounters various dark and light aspects of herself in the form of other characters, and no one is ever quite who they seem. The climax is usually some sort of face-off with the Wicked Father (and in the case of your first two books and many other Gothic Romances, the Wicked Mother). It’s not much different than The Hero’s Journey as outlined by Joseph Campbell and explored over and over in our more popular hero myths from Arthurian legends to Star Wars. I think a primary difference between Gothic and Fantasy Adventure is that the Gothic mindset is highly introverted. The action is more cerebral than physical. Beyond that, my stories are chock full of any number of paranormal shenanigans from séances and ghosts to Ouija boards and Tarot cards. Again, going back to my childhood in the late 1960s, Astrology and the Occult were all the rage. It was the dawning of the Age of Aquarius after all. I grew up in a Christian household where these types of things were highly taboo, so of course that made them all the more appealing. As I grew into my teen years I moved from reading Gothic Romance to Gothic Horror, Rosemary’s Baby, The Mephisto Waltz, Burnt Offerings, The Other, all of which heavily influenced my first book, Night of the Pentagram. In future installments, Lisa and I will continue our exploration of why we are entrenched in this business of writing Gothic fiction. We will continue to examine the archetypes as they appear in Gothic tales, with a juicy discussion on the use of taboo, along with plenty of shameless self-promotion and, you guessed it, more adoration of Barbara Michaels.